и плачења на погрешни гробови. и улици со отворени артерии. и едно дете кое не се плаши од дождот. само мене никој не ме виде. und Weinen an falschen Gräbern. und Straßen mit offenliegenden Arterien. und ein Kind, das keine Angst vor Regen hat. nur mich hat niemand gesehen. och gråt vid fel gravar. och gator med öppna artärer. och ett barn som var rädd för regnet. mig var det ingen som såg. Nikola Madzirov was born 1973 in Strumica, Macedonia, in a family of Balkan Wars refugees. He is one of Macedonia's most distinguished poets. His poetry has been translated into more than thirty languages and published in magazines and anthologies both in Macedonia and abroad. For his book Relocated stone (2007) he received the European Hubert Burda poetry award and the most prestigious Macedonian poetry prize Miladinov Brothers. For the book Locked in the city (1999) he was given the Studentski Zbor award for the best debut, while for the collection of poems Somewhere nowhere (1999) the Aco Karamanov prize. In 2008, Oliver Lake, one of the most original contemporary American jazz composers and collaborator of Björk and Lou Reed, composed music based on Madzirov's poems, which was performed at the Jazz Poetry Concert in Pittsburgh, USA. According to the poetry of Nikola Madzirov two short movies were shot in Croatia and Bulgaria. 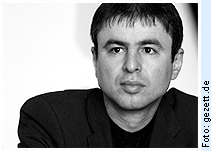 Madzirov has published poetry, essays and translations. He was poetry editor of the e-magazine for literature and culture Blesok and he is the Macedonian coordinator of Lyrikline. Madzirov has taken part in many international poetry festivals (International Poetry Festival in Nicaragua; Poetry Spring in Lithuania; Jazz Poetry Concert in USA; Ars Poetica in Slovakia; Struga Poetry Evenings in Macedonia; Vilenica and Medana in Slovenia...) and has received several international awards and fellowships: International Writing Program (IWP) at the University of Iowa in USA; Literarisches Tandem in Berlin; KultuKontakt fellowship in Vienna; Internationales Haus der Autoren in Graz; Literatur Haus NÖ in Krems and Villa Waldberta in Munich.